Despite the best efforts of equity leaders, our schools suffer from persistent inequities. 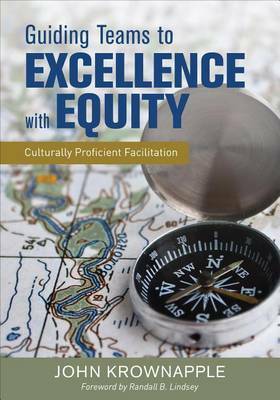 Guiding Teams to Excellence with Equity is a must-read for anyone who values equity and excellence and supports the professional learning of adults in our schools. Author John Krownapple helps readers develop as culturally proficient facilitators, and equips them with the skills, tools, and techniques to navigate the obstacles that arise during systemic equity transformations. This is the book leaders need to learn how to facilitate a group's journey from awareness to commitment to action in support of inclusion and equity. "What John has done here is remarkable. He's taken the intuitive art of facilitation, illustrated it with a story, and explained it with theory, data and graphic examples. It's clear, cohesive, comprehensive, and integrated. I like that we follow one story throughout, and that a plethora of facilitation techniques are embedded in that story. I particularly like how facilitation is contrasted with training. John has broken the facilitation rubric into bite-sized pieces, which makes it useful to leaders of professional learning. I love this book; Guiding Teams to Excellence with Equity is a book we've all been waiting for." "Based in abundant research, this valuable book contains myriad strategies and protocols for building collective efficacy in educational teams. It is a must for those who wish to perfect their facilitation skills, who desire a deeper understanding of the emotional and cognitive transformation during the human journey of personal enlightenment, and for those who believe that the future of our democracy depends on equity and cultural proficiency." John's book is a unique contribution to both the literature on equity and skillful facilitation. It contains compelling theories and research along with thoughtful reflection prompts and well selected protocols that help readers deeply engage with the content. John makes clear connections between the knowledge and techniques of skillful facilitation and the psychological factors underlying the change process. This explicit treatment of the material helps readers not only understand the importance of thoughtful facilitation but also the reasons behind facilitative moves. This book is beautifully written - by combining narration with information, John crafts a very persuasive argument for culturally proficient facilitation. "When embarking on a new journey, having an expert guide to lead the way instills the traveler with the courage needed to successfully reach the goal set before them. John Krownapple is the expert guide for those starting to lead the cultural proficiency journey for the school, school system, or organization for which they serve. Guiding Teams to Excellence With Equity clearly outlines how to effectively navigate self and others through the personal work involved with self-discovery and a deeper appreciation of others. Each part of his guide explains the emotions of those asked to take part in cultural proficiency work, how to meaningfully explain what cultural proficiency is and is not, and how to facilitate cultural proficiency sessions. The fictional telling of Jack McManus' story is a story that the reader connects with; all they need to do is replace Jack's name with their own. Cultural proficiency is the understanding of one's story so that they can understand others' stories. In a meaningful way, John Krownapple illustrates the importance of sharing one's story by allowing us to see and feel Jack's journey.